Art Touch Collection is pleased to pesent Kotaro Fukui: Solo Exhibition, curated by Luchia Lee. Kotaro Fukui’s work is notably steeped in the tradition of Nihonga and the modern Japanese avant-garde. This exhibition focuses on two of Kotaro Fukui’s favorite motifs: ostriches and irises. Fukui was fascinated by the beautiful eyes and the shape of the ostrich. His ostrich paintings, however, are not just about the ostrich. Fukui uses the ostrich metaphorically to explore the existence of paradoxes, such as black vs. white, big vs. small, and straight vs. curved. In irises, Fukui discovers the power of sunlight. The way that an iris blooms reflects the natural movement of the sun. When showered by sunlight the flower opens; lacking light the flower closes. By painting Irises, Fukui catches the beauty of life at its height and humanizes the role of the flower. 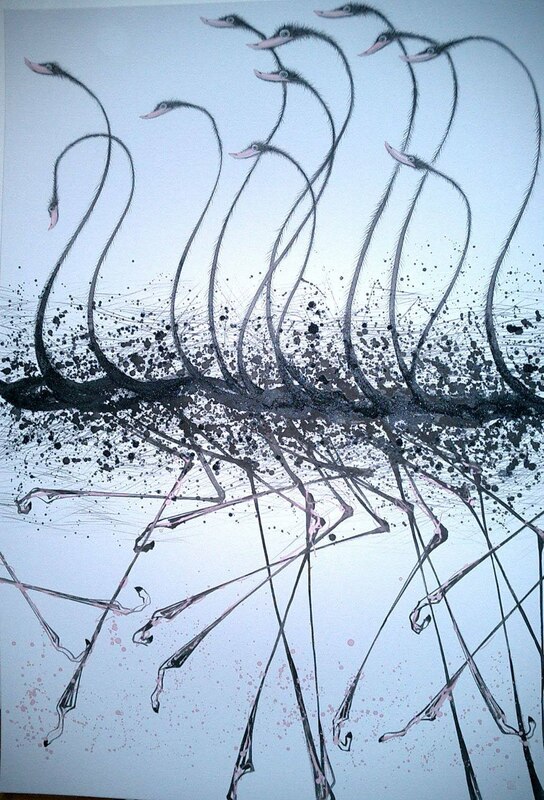 The Ostriches series investigates movement through the rotund shape and rich black coloring of the ostrich in juxtaposition with the linear form of the bird’s extended neck sets the stage for the magnetism of opposites. Fukui is equally eloquent in painting on Japanese paper (“Washi”)(1) and on canvas. The Irises series parades luscious blue Irises across brilliant, majestic gold leaf backgrounds on Washi. The iris is painted by Indian ink and natural mineral pigments mixed with crushed lapis lazuli, the same material used for the eyes of the golden mask of Tutankhamen and in the painting, "The Girl with a Pearl Earring" by Vermeer.